7) Build your blueprint (in no particular order): Modify device name and wallpaper as desired, add apps, add profiling, and set your blueprint to restore from the backup that you created. Applying a blueprint that has supervised backup incorporated into it to an unsupervised device will make all subsequent devices supervised, with all of your settings intact. During the process to apply the blueprint you’ll be prompted to restore and supervise devices. Keep in mind that you can only create one backup from a specific device. If you need to make a different backup you’ll need to grab a different device to do it. Good news is that you can apply a backup to a different device, modify the backup on that second device, and save it as another backup. So today I built a profile management server which is basically wordpress running on the excellent turnkey appliance, to get the .mobileconfig profile payloads uploaded I needed to edit my wp-config php file. There are many ways to set up Munki, since it’s just a webserver. 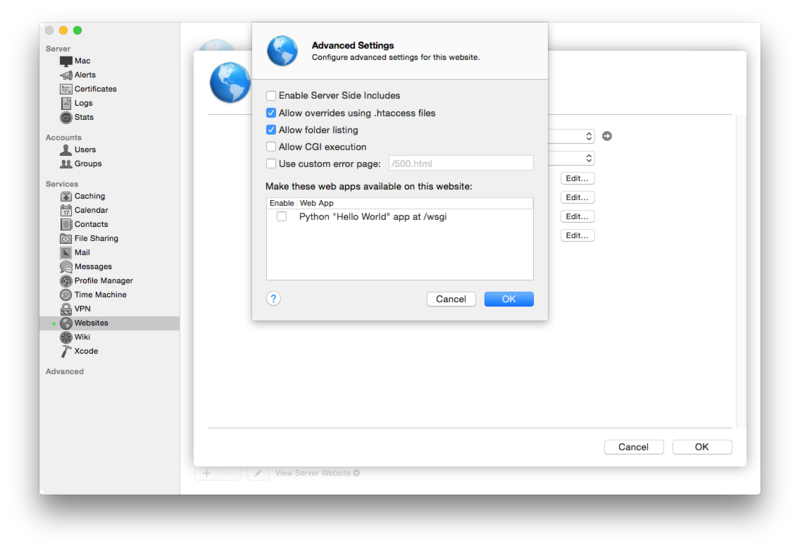 TheDemonstration Setup is a great way to get started, but doesn’t list the steps for setting up OS X Server. 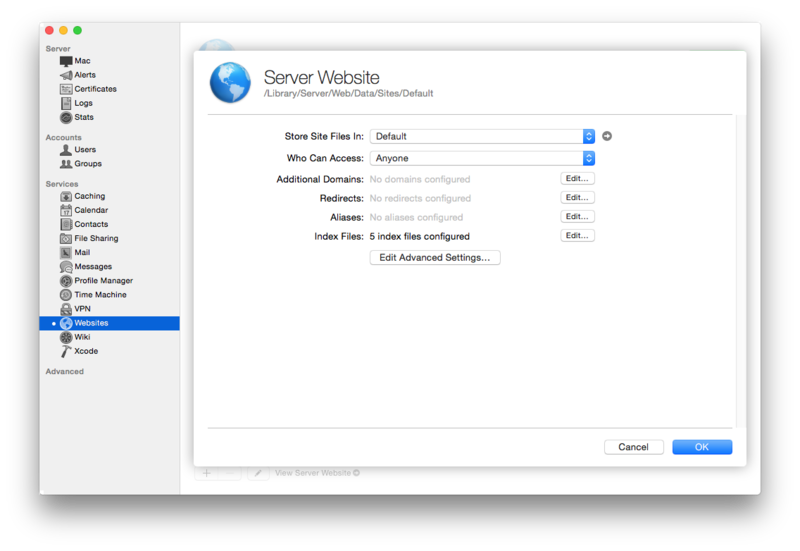 A lot of new Munki admins (or generally new Munki admins) may have an OS X Server they have access to, but not other web servers, so a guide to getting started with the latest version of OS X Server (as of writing time, that’s Server 4, on Mac OS 10.10.2 Yosemite) may be helpful. This is all assuming you’ve got Server.app set up and running. If the Websites service in Server.app is running, turn it off first. Turn the Websites service on. Here, you need to do two things on your OS X client. sudo defaults write /Library/Preferences/ManagedInstalls SoftwareRepoURL "http://localhost/repo"
sudo defaults write /Library/Preferences/ManagedInstalls ClientIdentifier "test_munki_client"
sudo defaults write /Library/Preferences/ManagedInstalls SoftwareRepoURL "http://ip_or_domain_name_of_server/repo"
We now have a working Munki repo – but it’s completely empty and not useful at all. 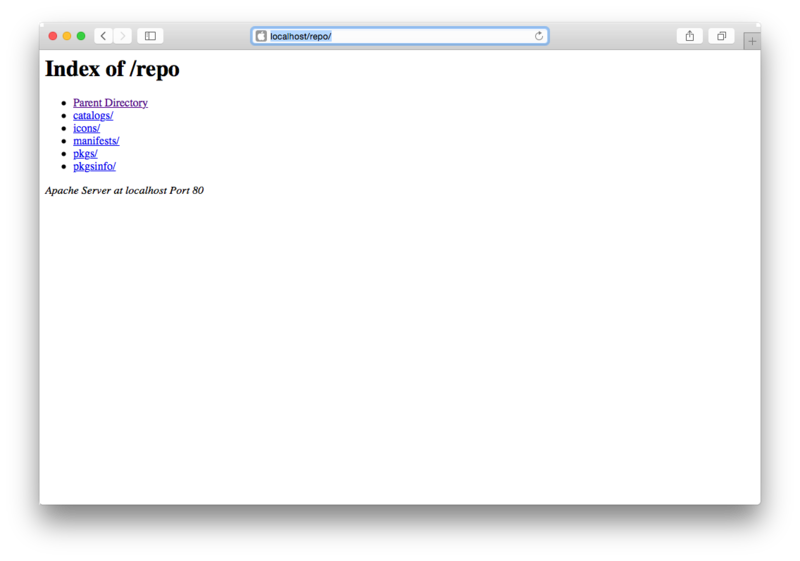 So let’s start to populate the repo. We’re going to use some tools distributed with munki to import packages into our new Munki repo. Download the current munki installation package at https://github.com/munki/munki/releases/latest. Install the Munki tools by mounting the disk image and double-clicking the Installer package and installing like any other package. A restart is required after installation. The tools you’ll use as an administrator are available from the command-line, and are installed in /usr/local/munki. This location is not in the standard search path, so you’ll need to either add this directory to your search paths, or be sure to type the full path when invoking these tools. The tool we will use to import packages into the munki repo is called munkiimport. We need to configure it before we can use it – telling it where to find our repo, among other things. We are first asked for the path to the Munki repo, and since we set one up at /Users/Shared/munki_repo, that’s what we enter. Next, we are asked for a repo fileshare URL. This is used when the repo is hosted on a remote file server, and this would typically be an afp:// or smb:// URL specifying the share. Since we’re hosting the repo on the local machine, we’ll leave this blank. We are then asked to specify an extension to append to the name of pkginfo files. Some admins prefer “.plist”, some prefer “.pkginfo”. Personally, I just leave it blank – Munki doesn’t care. Next, you are asked for an editor to use for the pkginfo files. If you like command-line editors, you can specify /usr/bin/vi or /usr/bin/emacs for example. If you, like me, prefer GUI text editors, you can specify a GUI text editor application by name (but be sure to include the “.app” extension). I picked TextMate.app, but you could choose TextWrangler.app, BBEdit.app, or even TextEdit.app. Finally, you are asked for the default catalog new packages/pkginfo should be added to. We’ll use a “testing” catalog for this.